Intersectional Peonies, more commonly referred to as ITOH peonies are an exciting new form of peony. These peonies are produced by selective breeding, crossing tree peonies with herbaceous or “garden variety” peonies. These were first produced by breeder Toichi Itoh, after which this type of peony is now named. The reason for the investment of time in producing intersectionals is that the colors available in tree peony blooms were not available in herbaceous forms. The resulting ITOH peonies exhibit the gorgeous blooms of the tree peony with the vigor of the herbaceous peony. A wide range of beautiful colors, including coveted yellow peonies are available in the ITOH peony. The foliage of these peonies die back in winter, just like the herbaceous type, emerging new lush foliage each spring. The greater benefits of the ITOH peony is the vigor of the plants over tree peonies, which can be finicky to grow. Blooms also last much longer than other forms of peonies, with many blooming up to a month long. Strong stems and large flowers that need no staking, and very abundant blooms per plant are all reason to love ITOH peonies. Herbaceous, or Garden Peonies, are easy care, classic perennials , noted for their lovely blooms and lush foliage. Choosing early, mid, and late season bloomers in a planting, will assure you blooms for up to 6 weeks. All peonies are fragrant, though some more than others. Most are hardy zones 2-9 (Check on your specific variety for hardiness). Peonies need a period of chilling cold and will not bloom well in areas that do not receive temperatures of 40 degrees or lower in winter. Plant Peonies in a permanent site, as they prefer not to be disturbed once established. Long lived, they last a lifetime with little care. They prefer full sun exposure, though in southern states, shade from hot afternoon sun can prolong the bloom. Newly planted roots can take a year or two to establish before blooming. Once established they are reliable and will have many blooms per plant. Peonies make great cut flowers. 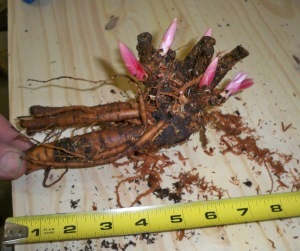 When planting peony roots place a a depth of 1 1/2"-2" below the soil line. In southern states 1" below the soil line is recommended. Soils should be fertile, have the ability to hold some water, and yet drain freely. Enrich soils with compost if needed when planting, and top coat plants yearly to maintain good soils. Mulching will help keep plants evenly moist and weed free. Best in full sun, in fertile, moist, but well draining sites. Peonies last a lifetime and prefer not to be disturbed after planting. Peonies are best planted in states that receive 40 degrees temps or lower in winter as a chilling period is needed for good bloom. At this time online ordering is available for Miscanthus Giganteus, Intersectional Peonies, Herbaceous Peonies, and various hard-to-find trees, shrubs and perennials. For information on any other plants please contact us at kathy@lacycreekgrowers.com, or by phone (517) 726-0026.